Week 25 – Time for an internal software upgrade? I’ll be speaking at the “I Can Do It!” conferences in Orlando and New York this fall. For details, visit here. Time for an internal software upgrade? This morning I readied myself to attend a baby shower for my niece who’s having a boy in August. It’s my first grand-nephew and we’re all excited to welcome this little guy into the world. As I finished getting dressed, I reached into a drawer to collect a pair of silver earrings and came upon a favorite talisman. Planning to send a previously written blog while I take the day off, I took it as a sign to choose this story. During a difficult period in my life, a time when I’d lost my friend Lucy and ended a romantic relationship all in the same week, I visited a place I always go to for comfort and clarity. I went for a walk on the beach. It was a cool, rainy day, and the clouds hung so low I felt like I could reach out and touch them. As I trudged through the sand, I thought about my life and the tough decisions before me. With each step, I felt the weight of the world traveling with me. After a mile or so, I stopped to look out over the water and when I began walking again, I looked down and noticed something shiny sticking out of the sand. Leaning in for a closer look, I discovered an object with the letters: “LUC” on it. A crystal polished by the sea. With the word LUCKY engraved on it. I couldn’t imagine the chances of finding such an extraordinary gift. I looked around expecting to see an angel lurking behind a sand dune . Within minutes I felt like the luckiest girl in the world. Suddenly my somber, gloomy day turned into something special. Finding the crystal in the sand had interrupted a pattern. Instead of feeling stuck in a story of woe and despair, I suddenly felt blessed and hopeful and optimistic. From that moment on, every time I saw or touched that crystal (and believe me, I carried it everywhere), I repeated this belief over and over in my head. It wasn’t long after that my life started to change. We spend a good deal of time identifying and releasing the limiting beliefs that keep us stuck or frustrated in life. And this work is important. Equally important, are the beliefs we choose to install. I’m blessed beyond measure every single day of my life. I’m the most courageous guy in the world. I have everything I need exactly when I need it. Next, find an object to represent this new belief and let it serve as a reminder to repeat the statement over and over to yourself several times a day. Then, start looking for evidence. Watch for the subtlest sign that your belief is beginning to manifest in your life. It will. Just be patient and observant. 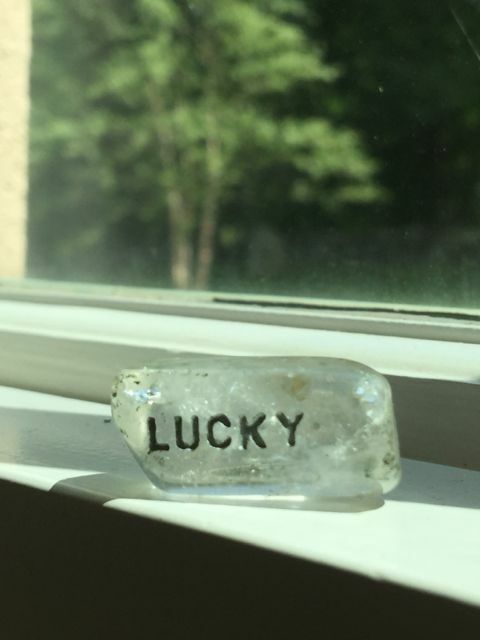 While I’ve worked hard to create the life I have today, I know I’ve also been the grateful recipient of a whole lot of luck. No doubt it’s related to one small decision made that day long ago during a difficult time in my life. That’s what happens when we intentionally install new beliefs. We reap what we mentally sow. Now here’s an awesome idea for those of us who need a room of our own. Check it out here. Thanks, Robin!